I think kids in general love to have things with their names on them. My daughter LOVES it when I make things for her with her name on them. Because her name is spelt in a less traditional way - Jordyn - she can never find anything that is spelt correctly. So she really appreciates anything personalized. Jordyn turned 11 this past week (where does the time go! 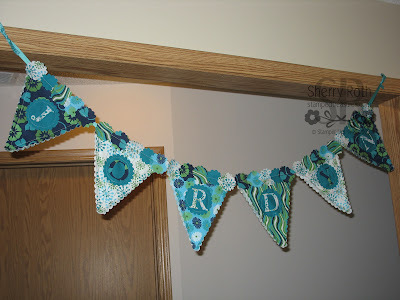 ), so I made her this fabric banner for her room. 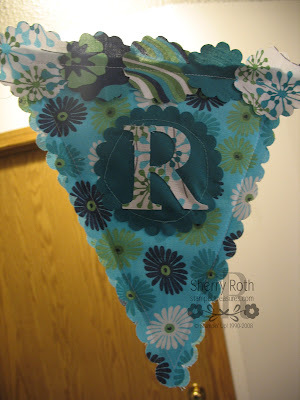 This was amazingly easy to put together using the Pennant Bigz XL die (113483). Here's a close up of one of the panels. Don't look too closely at my sewing, I have a hard time with a straight line, much less sewing in a circle! But apart from that, I'm happy with the way it turned out and even happier that she loves it! The scallop circle was done using the larger circle from the Scallop Circle #2 die (113469) and the letters were cut out using the Serif Essentials Alphabet and ironed on using Stitch Witchery (I think that's what it's called). If you don't have access to a sewing machine or can't sew, most of this project could easily be done using Stitch Witchery and an iron. I LOVE it! Yet another fabulous idea. Looks great. Can't wait to see what's next.